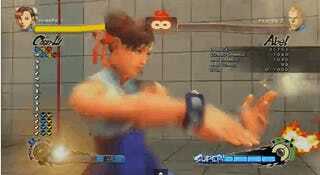 Chun Li's infinites are a perfect place to start but there's one major problem. As they only work against crouching characters, after the opponent is stunned (and they reset into standing) you won't be able to use them and there can only be a finite number of hits in the following combo (meaning that at some point it will end). In steps the 'stun glitch', which is a weird quirk of the SFIV system that allows the opponent to block at a certain point during stun but does not end the combo. In fact all combo factors are still in effect. So, meter build and damage scaling are both at 10% (this even applies to chip damage). If you interrupt the opponent during this block stun the combo will continue. 2 ways of doing this are to hit standing guard with a low attack or crouching guard with a jump-in/overhead. This is exploited to turn standing Abel into crouching Abel. At that point, infinites are viable again and no more stun is inflicted. So you can continue the combo as long as you want. Here, I've limited the combo to Abel's full stamina of 1050 points of damage, so that it could technically be performed outside of training mode for a 100% combo. In all, it's 276 hits for 1076 damage.